Self-preservation and military measures to insure the territory of the United States against violation by foreign powers—the subject of this book—ceased to be of serious concern to the United States Government and nation during the nineteenth century. In World War I, the Americans concentrated on the offensive. In World War II, as the authors of this book remark, we passed to the offensive so soon and with such force after the United States became engaged that the military provisions for defense have been obscured from view. The authors focus on these measures and relate them to the evolution of American foreign policy in the period 1938-41. The experience acquired in preparing for defense when the danger of direct attack was regarded as constituting a state of emergency is one of great interest in our present state of danger when deterrence has become the policy of the nation and its armed forces. 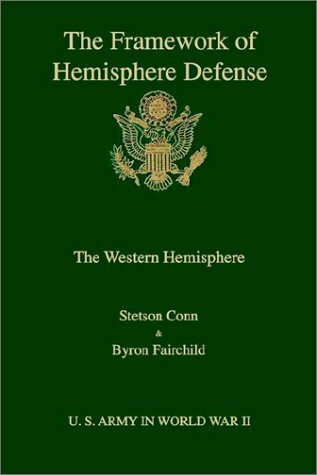 Stetson Conn received his Ph.D. degree in history from Yale University and has taught history at Yale, Amherst College, and The George Washington University. He joined the Office of the Chief of Military History in 1946. In OCMH he has served in the capacities of a senior editor; Acting Chief Historian; Chief, Western Hemisphere Section; and Deputy Chief Historian. His previous publications include Gibraltar in British Diplomacy in the Eighteenth Century, a volume in the Yale Historical Series. He is also one of the authors of the forthcoming Guarding the United States and Its Outposts, the second volume of this subseries. Byron Fairchild received his Ph.D. degree in history from Princeton University and has taught at the University of Maine, Amherst College, and the Munson Institute of Maritime History. He is the author of Messrs. William Pepperrell, which in 1954 received the Carnegie Revolving Fund Award of the American Historical Association for the outstanding manuscript in any field of history. A member of the OCMH staff since 1949, Dr. Fairchild is coauthor of three volumes in the World War II series: The Army and Industrial Manpower and, with Dr. Conn, the two volumes of The Western Hemisphere subseries. He is currently writing a volume on the Army and the Military Assistance Program in the post-World War II period.